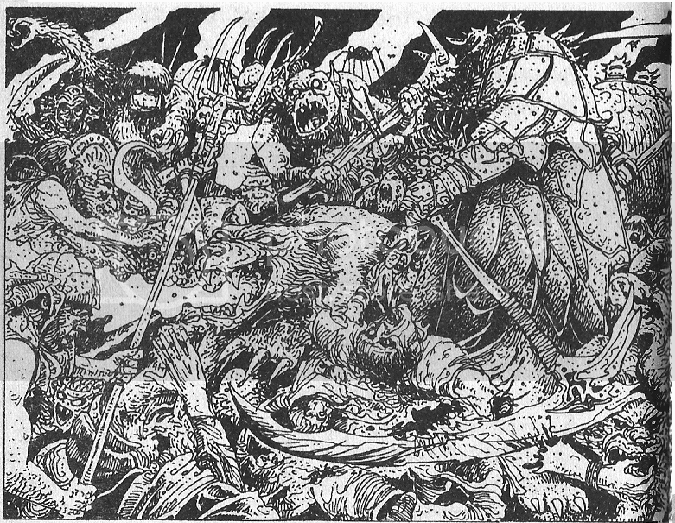 Oldhammer Forum • View topic - Fighting the Trolltooth Wars in 28mm. Advice please? Hi all. Thantsants and I have embarked on a mad adventure. 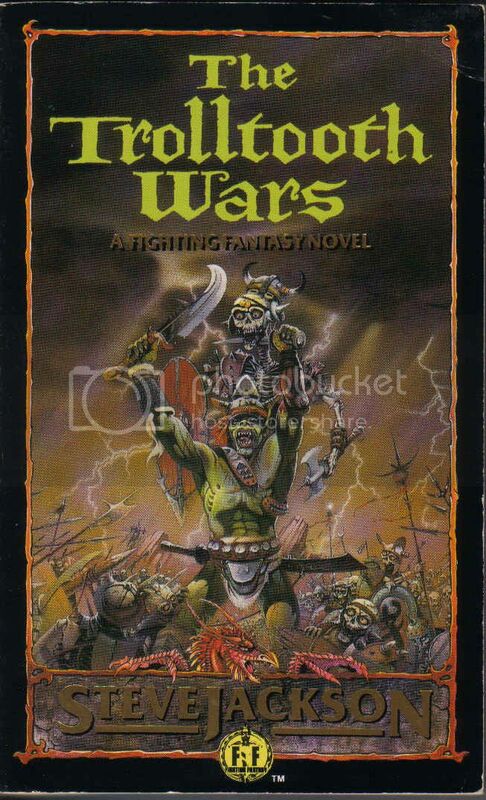 We are going to recreate on the tabletop (using WFB3) the conflict from Steve Jackson's Fighting Fantasy novel; the Trolltooth Wars. It's a fairly ambitious project but there is no need to rush so hopes are high! The original post about concept ideas can be viewed at http://warlordpauluk.blogspot.co.uk/2013/08/the-trolltooth-wars-project-concepts.html. Numerous Hill Goblins. Seriously, numerous Hill Goblins. Really, they are closer to a Warhammer Orc than a Warhammer Goblin so any decent Orc miniature will do really. A little armour would be a bonus. One tribe of fat Hill Goblins. Orc rabble. I see them as unarmoured and poorly equipped. Mixed 'drone' units of Barbarians, Black Elves, evil Dwarves, Ogres, Trolls and Kobolds. 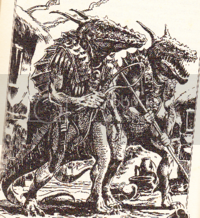 The Kobolds are probably more gobliny than doggy. Assorted Chaotics. I actually have most of these pinned down, my big remaining problem are the 8 foot tall two-headed, cloaked, scythe-wielding humanoids. I need some 'Eyeless Archers', what I was thinking was collecting a few Foundry Satyrs and green stuffing over the eye sockets. Let me know if you have any better ideas. Thantsants will probably post a similar want-list on this thread sooner or later. If you see anything suitable-ish going cheap on ebay let us know because cost is going to be an issue of we're not careful! This is going to be rumbling on for a while before we get it off the ground so if any ideas pop into your head just holler, all help is very much appreciated! Re: Fighting the Trolltooth Wars in 28mm. Advice please? 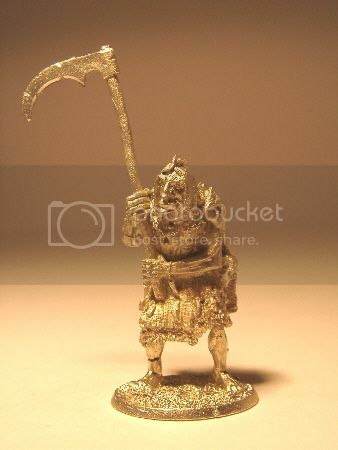 8 foot two headed (well not yet...), scythe wielding humanoid? Obviously he needs a cloak and a second head yet! Rhinomen are the tricky ones for me. There's a few nice rhinomen minis about but they tend to be huge and armed with a club or axe. 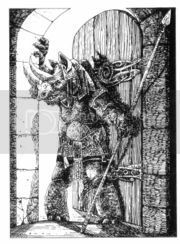 I need a well drilled, pike-armed phalanx of them kitted out in the livery of Zharradan Marr! The only problem being that the rhino heads are tiny - I'm thinking of grafting them on pretty much as is to the orc faces as a snout. These guys would be great but not at £8 a go! trolls. They are about as strong as the average orc, being about 5'9"
in height, only slightly taller than the average orc." 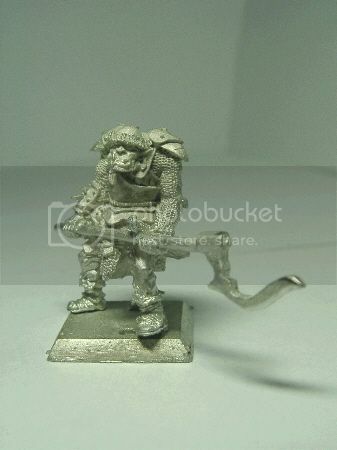 Mirliton's Goblins might be good as Hill Goblins? Those Mirliton ones look superb! Not an inconceivable price either, to do 37 tribes worth. Still need some fat ones from somewhere though! With the Rhinomen, it should be possible to remove weapons and replace them with pikes made from plastic brush bristles. A brush head should be about 99p from the right shop and is the best way to make pikes in any army imho. The store well, travel well and don't pierce the skin 10 or 11 times each game! That may open up a few extra miniatures for use? Cheapest Orcs on the marke for use as your Hill Goblins have to be the plastics fro EM4, easy to convert too. Cheers John - the 15mm option is quite tempting as there's some lovely stuff out there - especially the Rhinomen. They're perfect! I've seen the Reaper Rhino before - just wish there were more poses and he was a little cheaper! Should have thought to look at those Frothers miniature showcases - they're really good. There were some Red Box ones which I seem to remember being quite podgy too? 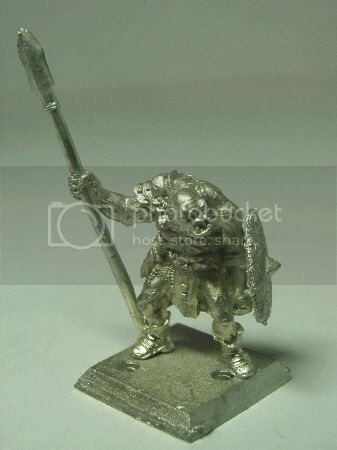 I like the bristle pike idea Paul - the metal ones I have for my Perry pikemen are lethal! Yeah, bristle pikes ftw. You can nip the end flat and trim it to a diamond shape easily too. Love those fat Goblins Just John! Thanks for pointing those out. I have just emerged from several years gaming WW2 in 15mm and don't have any passion for it right now. As sensible as it would be for the final battle there is quite a bit of skirmishing leading up to that, so I'm going to see if we can make it work with 28mm (scale of Kings). I think some of em4's bag 'o' Orcs will be necessary before we're done, depending on what ratio we opt for. 1:10 leaves us needing up to 500 figures each for the final battle with units up to 50 strong. It might be wiser to go 1:20, that way Dire's 5000 strong army only needs 250 miniatures to be represented on the tabletop. Marr's army is smaller still. I want to avoid cutting too many corners because this would make an excellent show table in years to come. No doubt Thantsants' Rigg's Shrine and Orc's Drift scenarios can keep us busy for two years but in 24 months it would be amazing to put the Trolltooth Wars on at a show. 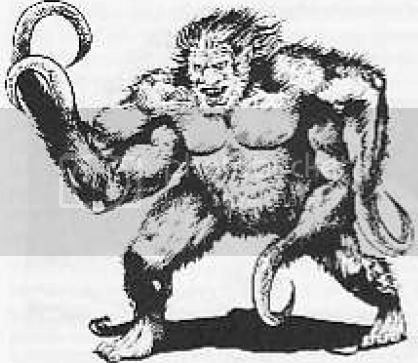 Help me with a link to those fat Goblins you mentioned Thantsants? I can understand the desire to game it in 28mm - it woould indeed make an impressive display game. You could always put out an appeal for 'mercenary' units and have a few other Oldhammerers contribute a unit of plastic EM4 orcs here or there - it would make us all feel part of it and the different painting styles would distinguish different tribes. Just a suggestion, but I'd be willing to raise a 'tribe'. They don't appear to be on the site - no doubt because he's retooling to cast them in plastic. 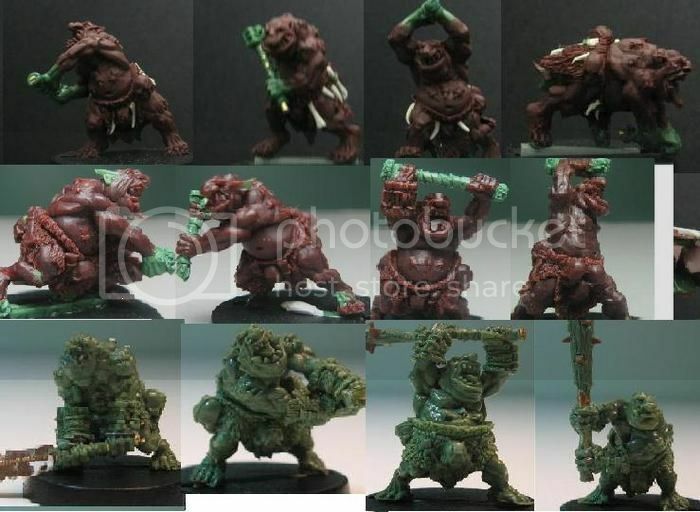 If you scroll down on the Red Box Kickstarter they appear as Goblin Bonebacks - lovely minis, but maybe a little too animated for the Stoneback tribe in Trolltooth - just noticed the similarity in names though! Doesn't look like they'll be available for a while either. 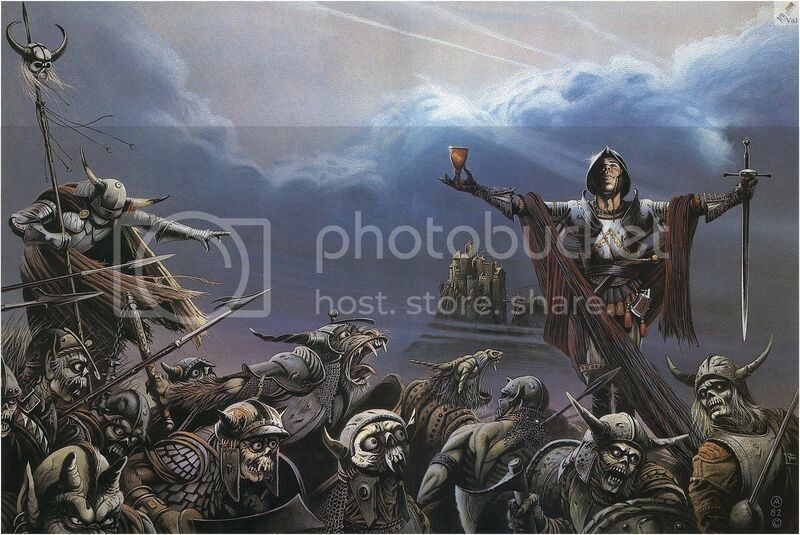 John - I love the idea of tribes of Goblins flocking in from all parts of the UK. I may be wrong but I have a feeling WP might want them all under one roof so we can run the game now and again at local shows and clubs. Most kind of you to offer though! I have toyed with a similar idea of setting up a different open ended campaign which would use the fact that we are all some distance away from each other - actually invading each other's patches and hopefully bringing down some allies with you. Add in some kind of resource management mechanic and consequences for successfully invading or defending territories like in Mighty Empires and it'd be a right laugh. That ratio of 1:20 for the final battle sounds about right - we'll just have to go a bit historical and keep notes/use markers to show the strengths of each unit as they take casualties in the battle. The skirmishes leading up to it should be fine in the good old ratio of 1:1 though. 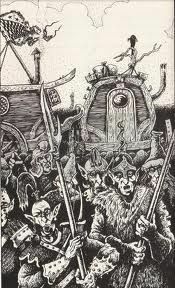 Thantsants wrote: John - I love the idea of tribes of Goblins flocking in from all parts of the UK. I may be wrong but I have a feeling WP might want them all under one roof so we can run the game now and again at local shows and clubs. Most kind of you to offer though! Actually I meant that if you were going the route of EM4 then I would happily purchase a bag of 50, paint them up and send them off to either you or WP to fight on foreign shores. At least then I'd feel part of it as it toured around seeing as how I'm stuck out here on the verge of civilization The advantage of that of course is that you'd be able to afford a scale of 1:10 As I say though only if thats the road you go down. Thantsants wrote: I have toyed with a similar idea of setting up a different open ended campaign which would use the fact that we are all some distance away from each other - actually invading each other's patches and hopefully bringing down some allies with you. Add in some kind of resource management mechanic and consequences for successfully invading or defending territories like in Mighty Empires and it'd be a right laugh.